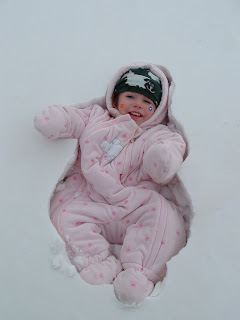 We got our first big snow a couple nights ago. School was cancelled yesterday, not because the roads were too icy, but there were too many snow drifts across them to be able to drive until they got plowed. 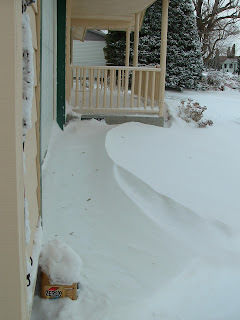 Some part of our yard had snow nearly a foot deep and other parts, you could see the ground underneath. 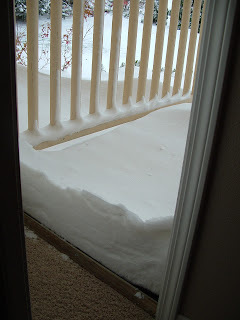 Our covered front porch had snow 6 inches or so deep. 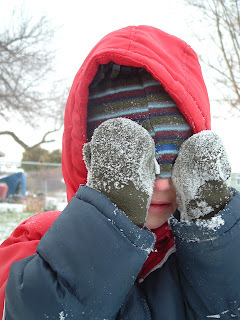 I know many of you reading this are already thinking I'm a snow wimp. I'm sure this snow storm wasn't all that big compared to ones we'll see later, but it's still kind of new and exciting to us. 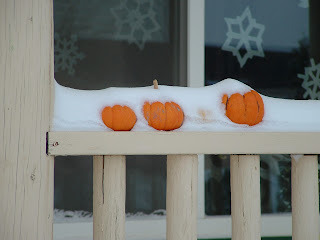 Our five little pumpkins still sitting on their gate. 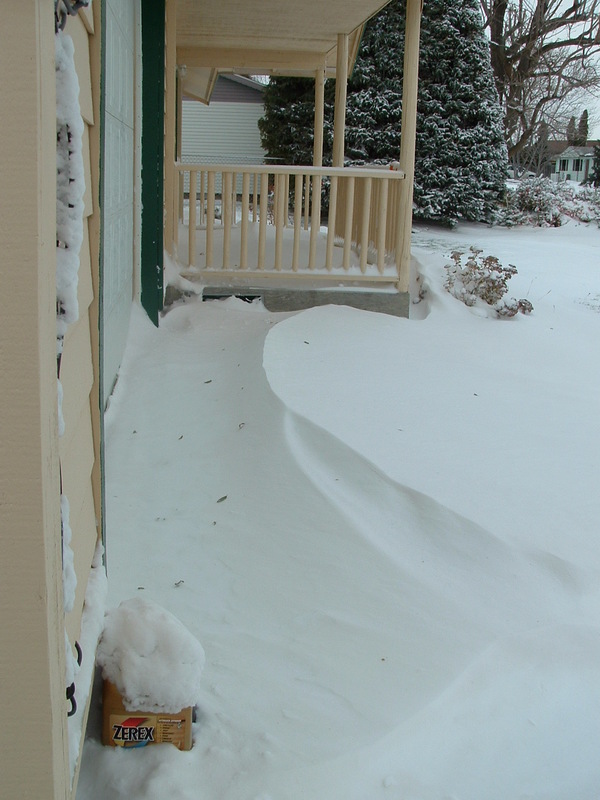 We've never lived in a place before where you got snow drifts. Portland and Seattle get very wet snow. Even when we lived in Utah, I don't remember ever getting snow that blew into drifts. Then I watched her as she walked across the big vacant field to make sure everything went okay. We can watch her walk all the way to her school from our back window. Then as Firecracker walked, she slowed down quite a bit and kind of doddled. I opened up the door and yelled at her to hurry, she did a bit, but then slowed down again...then I realized the snow was up past her knees and she was having a really hard time getting through it. 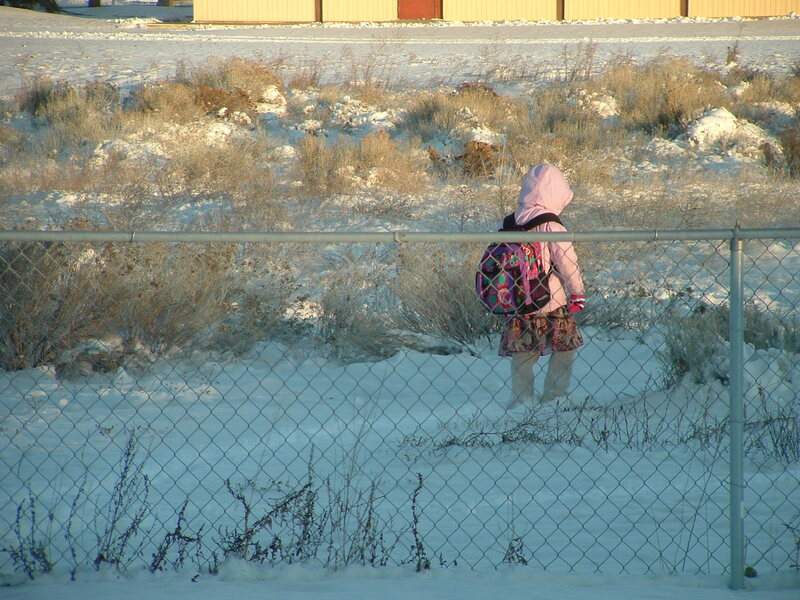 Poor girl, she's in kindergarten and her mother sends her out to walk to school by herself...through snowdrifts. I quickly put Sweet Pea in her crib and told Little Brother to be good while I ran out to help her through. 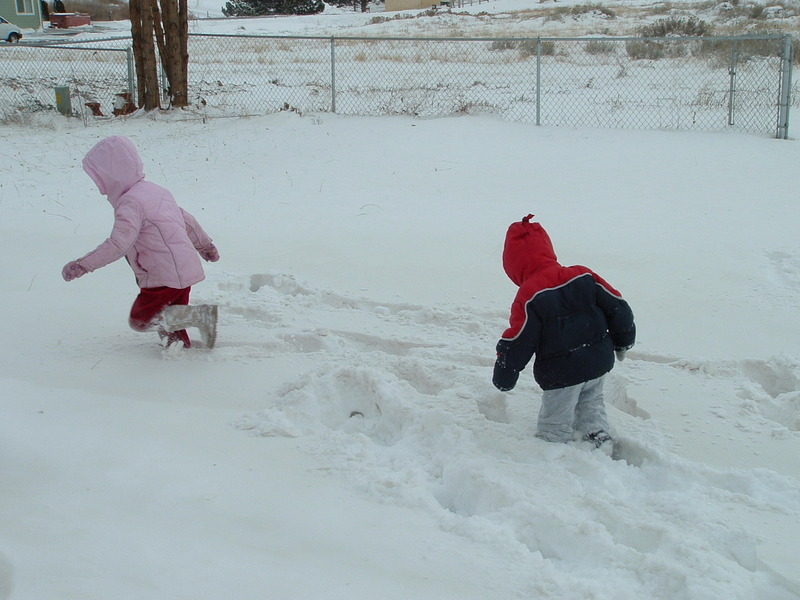 I figured it was better to leave them here for 5 minutes than to leave Firecracker stranded in the snow for 5+ minutes while I got them dressed warm enough to go out...and anyway then what...try to pull all three kids through the snow drifts. Anyway, she made it through and is presumably having a fun half day at school before we made the drive to Grandma's house for Thanksgiving. 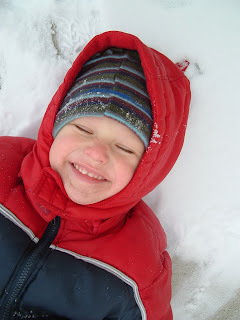 Besides the dicey walk to school, the kids are loving playing the snow. It's too dry for snowmen, though, so for now we'll still have to build our snowmen in the house. If you're not lucky (?) 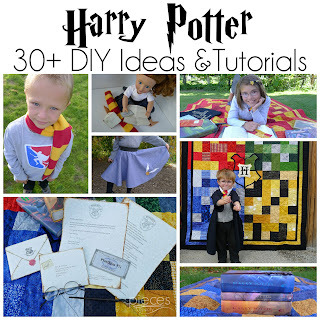 enough to have snow, or your kids are going stir crazy because they're cooped up because you have snow, you can check out my last couple posts with some winter activity ideas. 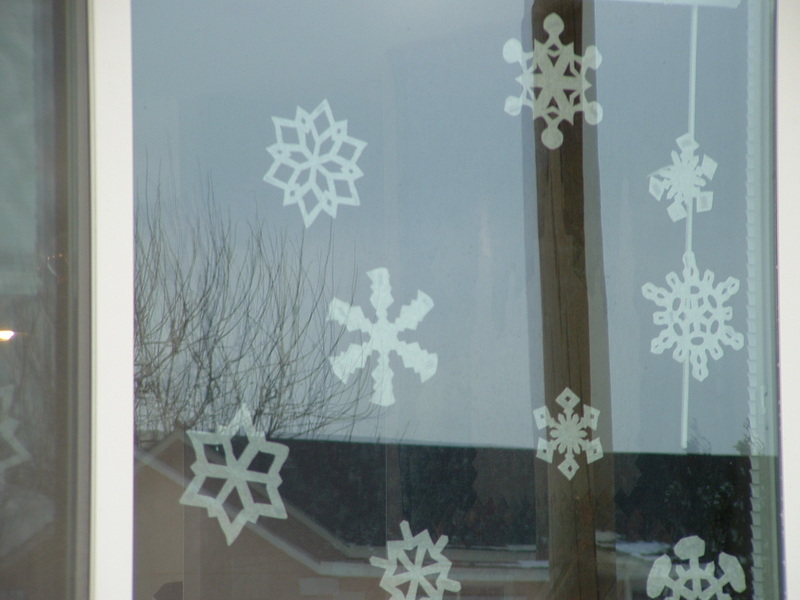 Best Ever Snowflakes...which I have to say...when I finally got a chance to go outside and look at them, they look pretty good from the outside too. Have a safe trip...over the river and through the woods to grandma's house! The story of Firecracker stuck in the drift will be a great family story. Good rescue job!